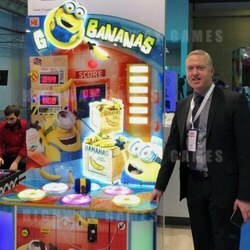 This year, the company showed The Go Bananas whacker, utilising the popular Despicable Me Minions licence (licensed from Universal Studios and Illumination Entertainment) and the Scooby Doo Mystery Wheel both from Baytek. "These are big licences that work extremely well in the region. The major operators in the Middle East have traditionally taken our whackers in quantity and this year was no exception," says Matthew Deith, Commercial Director. "We always look for licences that can be appreciated all over the world and which do not go out of fashion too quickly. In both these cases, the brands are evergreen and are popular with players of all ages," he adds. Harry Levy has attended the DEAL show in the Middle East since the 90s, and has enjoyed a great deal of success as the market has matured. They have supplied many of the world-class FEC attractions through their effective distributor, Amusement Services International (ASI).